It may come as no surprise to many that former president George W. Bush’s favorite writing utensil while in office was not a special ballpoint pen, probably the most common writing utensil in the world today, or even a fountain pen, that symbol of old-school sophistication. It was a black Sharpie marker. According to a Bush insider, the former president would ask for his markers by name, “and if someone hands him something else, he barks, ‘Where’s the Sharpie?’” The Bush Sharpies actually carried his signature and the white house printed on the side. He reportedly even had special camp david Sharpies. What makes Bush’s choice of writing utensil so appropriate has less to do with what he communicated in writing than with what many believe he failed to communicate. For a presidential regime marked by excessive government secrecy and restrictions on information flow, it is only fitting that a thick black marker would be central to the administration. As one source inside the White House explained, the president’s gift package for all new aides included a signed golf ball and baseball, a tie clip, cuff links, and the set of the presidential black Sharpies. All the better, we might presume, to black out inconvenient facts the administration didn’t want the public to see. While many other critics have already laid out the problem with the Bush administration’s overbearing secrecy policies—President Obama not the least of them—what draws my attention is not the battle between Republicans and Democrats, but those infamous black marks found on government documents and the process, called “redaction,” of how they get there. Beyond their most obvious function—namely, to cover up words deemed con­fidential—black marks have actually created a system of unintended signals and interpretations. Unlike the pen, a symbol of free thought’s transparent expression, or the sword, a symbol of free thought’s oppression, the black marker of government secrecy exists somewhere between these two places. It certainly obscures, but it manages to explain something, too. 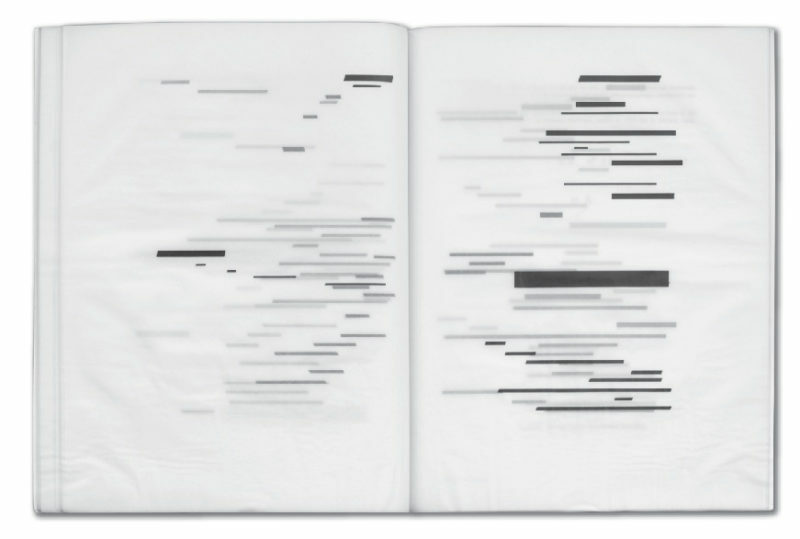 While the literal act of redaction attempts to extract information and eradicate meaning, the black marker actually transforms the way we read these documents, sparking curiosity and often stirring skeptical, critical, and even cynical readings. As redacted government documents make their way from government bureaus into the hands of citizens, a peculiar transformation seems to take place, one that seems to create a paranoia within reason. Based on all we know about government cover-ups over the course of the twentieth and twenty-­first century, and especially since Watergate, it is understandable that people would be somewhat paranoid in their interpretations of the motivations behind government secrecy. Bad things really have happened behind the veil, and many powerful leaders, such as members of the Bush administration, really have tried to cover things up. But paranoia within reason possesses a second sense, which is more obscure and harder to figure. Systems of reason and rationality, including massive bureaucratic machines, can actually generate paranoia. Regardless of the intention behind re­daction, the black marks created as a result of bureaucratic operating procedure have become an icon and ­index of paranoia. In other words, although the law intended to ­negate or eradicate meaning through redaction, the documents produced instead have contributed to a paranoid cosmology, a web of virtually uncon­trollable interpretations and revisions that operates parallel to official interpretations of government secrecy. In this completely reasonable yet paranoid world, black marker redaction can imply many things, from the repression of truth to the romance and mystery of government secrecy. But one thing it almost never refers to is the actual bureaucratic practice of redaction. The black marker itself, both the tool and the prime symbol of redaction, is a fairly recent invention, part of a catalog of mundane office products invented throughout the nineteenth and twentieth centuries, alongside objects like Wite-Out, carbon-copy paper, or paper clips. Sidney N. Rosenthal invented the marker in 1953 when he attached a brush to an ink-filled glass jar in order to provide a method of writing on a wide variety of surfaces, including plastic, metal, wood, cloth, and leather, as well as paper. Later, in 1970, Rosenthal would sell the rights for his “Magic Marker,” and, in 1988, the rights were purchased by Binney & Smith, owner of the Crayola brand. Other companies began producing similar markers alongside Rosenthal in the 1950s, including Paper Mate and Pentel.­ Sharpie introduced its marker, Bush’s pen of choice, in 1964. Exactly how much information the government withholds is largely unknown and difficult to calculate. The government’s Information Security Oversight Office annual report claims that executive agencies reported 23,421,098 combined classification decisions in 2008. The irony of this staggering pile of secret documents is that any act of omission, while perceived by some as a grave injustice, cannot truly impact us until we finally learn that we haven’t learned what we had wanted to. However, thanks to the Freedom of Information Act (FOIA) of 1966, citizens have been granted the opportunity to request “secret” government records. FOIA, though passed to counteract overly and arbitrarily secretive government agencies, ironically ended up setting the stage for the black mark redaction process, which has become the infamous symbol of government secrecy. If government bureaucrats deem some portion of a requested record secret—pursuant to a list of nine FOIA exemptions, which include personal privacy, national security, and others—then they will expunge those segments. In most cases, this has meant turning them black. The redaction process is not part of a secrecy law, but an information-access law. Perhaps no group is more perplexed about the gap between perceptions and reality of government secrecy than the government’s FOIA officers. The Freedom of Information Act, born in 1966, during Lyndon Johnson’s presidency, provides FOIA officers with a set of bureaucratic codes that seeks to standardize the flow of government information. And to the best of their ability, these bureaucrats use the word of the law itself, in addition to an annual FOIA manual from the Department of Justice and conversations with departments who have created requested documents, to interpret and assess FOIA requests. FOIA requesters do not ask the government questions and get answers. Instead, they must request specific records. In a sense, this system works like an extension of clerical duties. An FOIA officer must, by legal obligation, fetch requested files for the public, and then figure out whether or not the requester—part of a group that potentially consists of everyone in the world who isn’t working in the capacity of a government agency—has proper clearance to put their hands on the record. In 1966, the original version of FOIA never intended to put bureaucrats through the exercise of black marker redaction. In its first iteration, if some portion of a document was classified as secret, then the whole document was secret and could not be passed on to the requester. As a result of this unforeseen consequence and other technical issues, FOIA was comparatively ineffectual in its first decade compared to its present form. It took a series of FOIA amendments and legal precedents to rectify many of these situations. Added as part of a 1974 amendment, FOIA now requires that “any reasonably segregable portion of a record shall be provided to any person requesting such a record after deletion of the portions which are exempt.” This provision was designed to shift exemptions from entire documents to specific segments within documents, effectively creating the practice of black marker redaction as we know it today. In training manuals and court precedents, the bureaucratic concern with redaction is not, as many might suspect, about whether FOIA requesters might conceivably read between the lines of the black marker, but instead about whether, after redaction, the record any longer carries meaning. in order to apply the concept of “reasonably segregable,” agency personnel should begin by identifying for deletion all portions of the requested document which are to be withheld in order to protect the interest covered by the exemption or exemptions involved. The remaining material (assuming it constitutes information that is responsive to the request) must be released if it is at all intel­ligible—unintelligibility indicating, of course, that it is not “reasonably” segregable from the balance. While the government may call black marks meaningless, for decades artists have developed and experimented with their own ideas about meaning, its concealment and potential eradication through the use of, among other techniques, black marks. In 1924, Man Ray published what is assumed to be a poem in the Dada artists’ journal 391. With sets of thick black horizontal lines arranged in seventeen rows that appear to make up four stanzas, Man Ray’s simple black-on-white work begins to take the shape of how a poem might be structured, including three dashes on top that look like a title for the work. Of course, without any note or explanation, it’s impossible to truly say whether the work is a poem that has been redacted or simply a set of random black dashes, like Morse code. While Man Ray may have objected to the workings of the American or European governments in his time, his poem was not a critique of government secrecy or censorship policies. It was, instead, a reflection on the nature of writing and the power of the text, properly laid out, to construct forms that provide meaning. For Man Ray, like many other Dada artists of his time, the goal was to deconstruct, experiment with, and possibly even destroy meaning, laying bare the nature of our customs of reading and writing. Not only was Man Ray not reflecting on CIA secrecy tactics in 1924—because the CIA didn’t even exist in 1924—but he was instead probably in conversation with an idea that began in the late nineteenth century focused on poetry that breaks from and experiments with notions of form. Nowhere is this experimentation more artfully accomplished than in Stéphane Mallarmé’s 1897 poem “Un coup de dés jamais n’abolira le hasard” (“A Throw of the Dice Will Never Abolish Chance”). This unique work spans about twenty pages, its words literally flowing across each two-page spread. Employing different type sizes and fonts, Mallarmé effectively manipulates the meaning of his poem by calling the reader’s attention to the distinction between the meaning of a word and its actual printed manifestation on the page. A surplus of white surrounds many of the lines in a kind of silence, as blank spaces begin to take on significance equal to the words of the poem. Through this device, Mallarmé manages to control the way that the reader reads, particularly by regulating the tempo of reading and forcing the ­reader’s eyes to more carefully navigate their way from the end of one line to the beginning of the next. But as much as Mallarmé controls the reader’s experience, he also allows and opens up multiple ways of reading through the text, by scanning the poem, for example, for words or phrases set in a similar typeface. In creating this experiment, Mallarmé also calls attention to the role of the typesetter, who himself becomes an artist and a coauthor of the poem. The result is a rupture between the content and the form of writing. In 1969, a struggling Belgian poet-turned-artist named Marcel Broodthaers would appropriate “Un coup de dés” for a unique experiment in the design and form of ­poetry. Broodthaers, apparently enamored of Mallarmé’s unconventional layout, decided to further highlight its graphic form and further reduce the significance of its content by blacking out the poem and redacting the entirety of the text.1 Broodthaers’s redacted poem was printed in an edition of artists’ books, with a series made of different materials, including aluminium sheets, translucent paper, and regular paper. Much like Man Ray’s “poem,” Broodthaers’s work, which also preceded the FOIA redaction amendment, was not a statement about, critique of, or response to government secrecy policies, but an examination of the way that the form and layout of words can manage to communicate a message. By experimenting with a poem’s­ layout and the ability of typesetting to tell a visual story that supports the meaning of the written word, Mallarmé’s “Un coup de dés” anticipates the emergence of contemporary graphic design. And it is telling that graphic designers today, ­masters at deciphering and re­appropriating the symbolic vernacular of pop culture, often use black marker redaction as a kind of shorthand to communicate the ­struggle between truth-seekers and the oppressive power of state authority. This design motif can be found often, for example, in book-cover design, such as Shahriyar Mandanipour’s 2009 novel, Censoring an Iranian Love Story, and the anthropologist David Price’s 2004 book, Threatening Anthropology: McCar­thyism and the FBI’s Surveillance of Activist Anthropologists. This design-friendly aesthetic also pops up in Brian De Palma’s 2007 film, Redacted. In all of these cases, graphic designers do not intend to literally use black marker redactions or typewritten text in order to cover up words, but instead as powerful icons of struggles against secrecy. What’s fascinating about this unintended and inadvertent evolution of blacked-out text is the way all of these works demonstrate that textual productions never ­simply represent thoughts transparently (i.e., offering a transparent frame into the “mind’s eye”), but must attempt to represent ideas by manipulating objects through material practices. Redaction has the potential to remind us that writing is a public and material system of things in the world, consisting of ink on paper. This suggests that the communication or manipulation of meaning does not necessarily happen in covering up what’s “really” being said, but in the black mark itself. Black marker redaction creates a meaning apart from words that serves to refer to the act itself, drawing out the boundaries of knowledge structured by the people who make the mark and reminding us of their presence. However, the act that the black mark refers to is not necessarily the FOIA officers with markers in hand, but an entire assemblage of practices that have created and sustained the national security state since its emergence. There’s something about secrecy that, for a variety of reasons, seems to be an inherently fascinating subject, one that easily manages to capture collective imaginations. Even inside of the bureaucracy, where handling confidential documents is commonplace, some air of mystery and fetishization still seems to exist. In one telling case during my research, I made a request for an FOIA training video held by the Department of Defense called The Right to Know, which, ironically enough, was denied to me for over eighteen months. When I finally received the video, clips from films had been cut out from the released record because of copyright issues. Even more bizarre, however, the training film was inspired by the movie Casablanca. The Department of Defense had hired an instructor/narrator to speak in a fake Humphrey Bogart accent, trying to evoke an air of mystery for the sake of information-­policy education. Over the course of the film, this detective narrator follows a couple of mysterious characters called “Veiled Lady” and “Large Man” while explaining the Pentagon’s FOIA policies on disclosure and secrecy. While the purpose of the film seemed to be to make a boring subject entertaining, the poor production served only to reinforce the contrast between the popular romance of government secrecy and its rather boring reality. But in places where cultural production takes a unique material form, objects tend to take on a life of their own. These are sites where authorial intentions and audience interpretations part ways, often wildly. And in the case of government documents, this seems to happen at the intersection of the romantic mystery of secrecy and the tedium of a bureaucrat wielding a black marker. Because the bureaucrat’s intention has been so thoroughly blacked out, an interpretive space is created that could lead in many possible and even contradictory directions. To be sure, these blacked-out documents are cultural productions. Death to all modifiers, he declared one day, and out of every letter that passed through his hands went every adverb and every adjective. The next day he made war on articles. He reached a much higher plane of creativity the following day when he blacked out everything in the letters but a, an and the. That erected more dynamic intralinear tensions, he felt, and in just about every case left a message far more universal. What is unique about Yossarian’s episode as a censor is not just that he was given the power of censorship, but that he accomplished his task by striking the letters with black marks. Here, the black mark becomes an icon for the potential absurdity of power, rendering the practice of redaction a territory ripe for satire. In this case, Heller provides readers with one possibility for how redaction could proceed. Yossarian wields power in the only way he understands it: arbitrary, absurdist, and paradoxical. Heller’s Catch-22 captures the bizarre essence and paranoid logic of bureaucracy, as outsiders experience and encounter it indirectly through a skewed perspective. Heller­ describes this strange logic by indirect means, as Yossarian’s failure to engage bureaucratic power directly is exactly his predicament with the catch-22. Every time Yossarian tries to grasp a truth of the bureaucracy, the rules manage to elude him. And in much the same way, the black marks that Yossarian creates are intentionally elusive. For those who do not know the rules, and this is especially the case when those rules are themselves secret, puzzling together what’s happening inside the bureaucracy is a frightening problem. In this sense, Heller has a lot to tell us about how ordinary people interpret redacted documents—not in the way a legal machine would, but as a sane person should. The unanticipated result of increasingly overwhelming layers of bureaucratic codes, regulations, and legal precedents has managed to create monstrous objects. The secrets are right there before our eyes, demanding we trust that the government has objectively and legally applied the rules of secrecy, though even if it hasn’t, we would never really know. As Heller reassures us, the only “reasonable” response to any of this is paranoia. Few cultural productions of recent memory manage to elicit the fascinating tension between openness and secrecy better than a series of paintings (2000–’03) by Arnold Mesches and paintings and projections (2004–’09) by Jenny Holzer, both of which directly appropriate heavily redacted FOIA documents. While these artists don’t take black marker redaction too literally—in that they don’t actually use black markers in their work, but paint or ink—they nonetheless seem equally inspired, curious, and very angry about the black marker. Mesches’s series is an auto­biographical exploration. Beginning in the 1940s, the painter had been involved with various leftist demonstrations, causes, and civil-rights campaigns. But it wasn’t until years later that Mesches learned the FBI had been investigating him from 1945 to 1972, thanks to a 760-page FBI file Mesches obtained through an FOIA request.2 He used these redacted documents as an inspiration for a series of paintings entitled the FBI Files, directly copying parts of some documents onto canvas. Having found the redacted documents “aesthetically beautiful” and reminiscent specifically of Franz Kline paintings, Mesches created a series of “contemporary illuminated manuscripts” that juxtaposed pop-culture images of figures like Rosa Parks and Richard Nixon next to painted depictions of his own FBI files. In doing so, the artist attempted to evoke a structure of political feeling during the era he was under surveillance, a time period marked by suspicion, mistrust, and conflict between the government and many of its citizens. Mesches was particularly conscious of a parallel between this earlier time period and the early 2000s, when he created his work, as he felt that the Bush regime was re-creating a similar cultural environment of suspicion and paranoia. Holzer’s works also came from FOIA requests, but not from her own personal files. Many of her documents, obtained through the National Security Archive at George Washington University, were already public and had been used by journalists to invalidate some of the Bush administration’s arguments for going to war in Iraq. Holzer’s­ paintings, called the Redaction Paintings, and a series of projections of redacted documents on the sides of buildings in major cities, called Truth Before Power, are part of the artist’s ongoing exploration of discourse in the public sphere. Many of her works have been motivated by a critique of American society and a powerful desire to seek social justice. In both cases, these artists raise a similar problem: While words are intended to deliver truth to us, what happens when words get redacted? Not just deleted, but blacked out, crossed out, or scratched out? The word is gone, but the form remains. There’s a big difference between deletion and redaction. With deletion, a reader never knows that they couldn’t know what they never read, saw, or heard. But with redaction, they are fully aware that they can’t know something that actually does exist. The black marks are mocking us, telling us that we do not have the right or the security clearance to deal with this information. Not surprisingly, this raises the ire of truth-seekers like Mesches and Holzer. Given the right context, there may be no better way to evoke the curiosity of an average reader than to black out some piece of information they are searching for or, at least, would like to know—particularly when the information concerns the workings of a larger, often furtive organization. After all, it’s a mystery. What’s going on back there? What does it say? What is the truth? The mind races. Alternate explanations come to the surface. Paranoia grips our interpretations. And then the conspiracy theories emerge. It’s all there, right within our grasp, but not quite. Unless, of course, it’s not, and they—that all-powerful “they”—are just playing tricks on us. Maybe it’s what Yossarian is up to, just random black marks. Maybe it doesn’t mean anything at all. Now they’re really playing with us. Take, for instance, Robert Storr’s interpretation of Holzer’s Redaction Paintings in her series’s catalog essay, which begins by remarking, “It is one of the ironies of human nature that those who commit criminal acts often document them when shame or fear of retribution would dictate that no trace be preserved.” He then proceeds to compare the Bush regime with Nazi Germany, Soviet Russia, Pol Pot’s Cambodia, and so on. We don’t actually know what’s underneath those black marks, but damn it, it must be evil—really, really evil. These artworks draw an inherent connection between the aesthetics of the black mark and the paranoid logic of redaction. Both Mesches and Holzer manage to elicit strong emotions when truth gets obstructed: feelings of injustice, even outrage. But the artists are limited in their ability to represent this common exercise of power and authority. The ugly black marks, simultaneously producing interesting graphic incidents that Mesches calls beautiful, offer a striking contrast between the authoritarian bureaucrat’s typewriter and a last-minute black marker scribble. The truth was narrowly ours, before it was torn from us. It’s all part of the cultural romance that revolves around these redacted documents. Weisberg’s actual espionage story is more John le Carré and Graham Greene than Ian Fleming. Instead of daring and courageous acts, Weisberg chooses to focus on the more mundane aspects of how a typical spy closely follows the guidelines of his craft taught by CIA instructors. Like any contemporary workplace in the knowledge economy, the most challenging aspect of the technocrat’s job is when he must decide whether to strictly follow rules or take some initiative. Taking initiative gets the main character in trouble but allows him to discover what he really wants in the story. Weisberg had good reason to publish the novel in redacted form. As a former CIA employee, he was forced to allow the agency’s Publications Review Board to examine anything he authored relevant to his past intelligence work. But in interviews, Weisberg explained that he took the initiative to redact his own text before the review board even looked at it, and he may have added further redactions after the CIA had its way with the text. The resulting novel is eerie in many ways that aren’t entirely positive. For one, all place names outside of America have been redacted. We get a sense that the novel probably takes place in Asia, and perhaps in a former British colony, because many locals speak English. But the redaction goes further, covering up references to local customs, cuisine, and history. As a consequence, much about the characters who are natives to this foreign land feels hollow, devoid of any local context. It’s as if these people could possibly exist somewhere, anywhere, or nowhere in the third world. Since cultural and historical context provides layers of meaning, the potential depth of the novel gets flattened out through redaction—though the redactions also provide a layer of meaning concerning the culture of government secrecy. In addition to local details, Weisberg and his CIA collaborators redact details of standard CIA practices, like how a dead drop works or how to run a “surveillance detection run.” While the country redactions are scattered throughout the novel, these CIA practices make up condensed bulks of blacked-out text. On page 162, for example, our CIA man picks up his foreign-agent informer and proceeds to give him “his first lesson in tradecraft.” The entire next page is blacked out, except for the phrase “Ralph took it off and put it in his lap.” As a reader, I have no idea what that means, and after a careful examination of the context of the redacted text, I still have no idea. It’s not that Weisberg’s redaction is not working. It is. Rather, Weisberg fails to provide any insight into the strange metaphysics of the black mark. He doesn’t seem to buy into the mystery of redaction—which makes sense, given he was both author and redactor. Also, from Weisberg’s perspective as a former CIA agent, he understands all too well what a mundane and routine act black marker redaction really is. Through the course of writing this essay, I discovered remarkable depth and complexity in the gap between the perception and reality of government secrecy. And in many ways, it became apparent that black marker redaction actually signifies this gap itself. Perhaps nowhere did this become clearer than in an FOIA training course I was allowed to attend in Dallas, Texas, in 2002. For two days, our instructor provided us with the context and details of the law’s structure and very carefully deciphered the entirety of the FOIA manual published by the Department of Justice, a book hundreds of pages long and about four inches thick. Finally, we came to learn about redaction. After going over all of the details of what makes for “reasonably segregable” sections of a document, our instructor provided a decidedly more practical insight. Bureaucrats don’t use black markers. Nowhere could my own personal gap between perception and reality of government secrecy become more shocking and apparent. Before FOIA officers would begin to redact sections of a document—and admittedly nowadays many of them opt for computerized forms of redaction because they are working on computer records—they make a photocopy of the document. Then, they take a red or brown marker and, more or less, highlight the segments unfit for access. Running this red marker redacted document through a photo­copy machine set for high contrast produces a new document with black marks. The FOIA officer can then store the red marker document in the ­agency’s files, allowing other bureaucrats to see exactly what has been redacted. If a black marker was used, then anyone needing to revisit the document would be unable to see what had been redacted without arduously comparing the document with the original, side by side. Above all, this felt like one of those informal practical tips that bureaucrats probably learn while huddled around the water cooler or sitting at a coffee break. This insight about black markers and red markers only provides further proof that the way average citizens understand redacted documents differs dramatically from the way that the bureaucracy makes them. The American government never intended redaction to become the mystery it has become and never intended redacted documents to be read in the way they have (or to be read at all, in the case of the black marks). FOIA was never even intended to provide for redaction; this practice emerged as an innovation to improve information access, ironically enough. But as these black marks crossed the chasm from the bureaucracy into the public sphere, they managed to discover a life of their own. 1. While Broodthaers probably didn’t use a black marker for this work, Anne Rorimer notes that he did use a “magic-marker” in many of his other works, which often involved striking through, typing an X through, or completely blacking out parts of his writings as part of his visual-arts production. 2. Technically, this was a Privacy Act request, because FOIA doesn’t cover personal records, which are exempt from disclosure in most cases. But the redaction process in a Privacy Act request works in a very similar manner, and Mes­ches repeatedly refers to FOIA in his interviews and in reviews of the work. 3. In fact, skilled FOIA readers make use of notations in the margins of a redacted document where bureaucrats document references to the specific exemption that applies to each blacked-out section (e.g., the note “b6” would refer to exemption 6, which restricts release of personal or privacy data). 4. To get technical, he actually uses neat, blacked-out rectangles drawn by a computer. Michael G. Powell is a cultural anthropologist who is writing a book on the art of information access. He also works at a design firm in Los Angeles where he watches people shop.